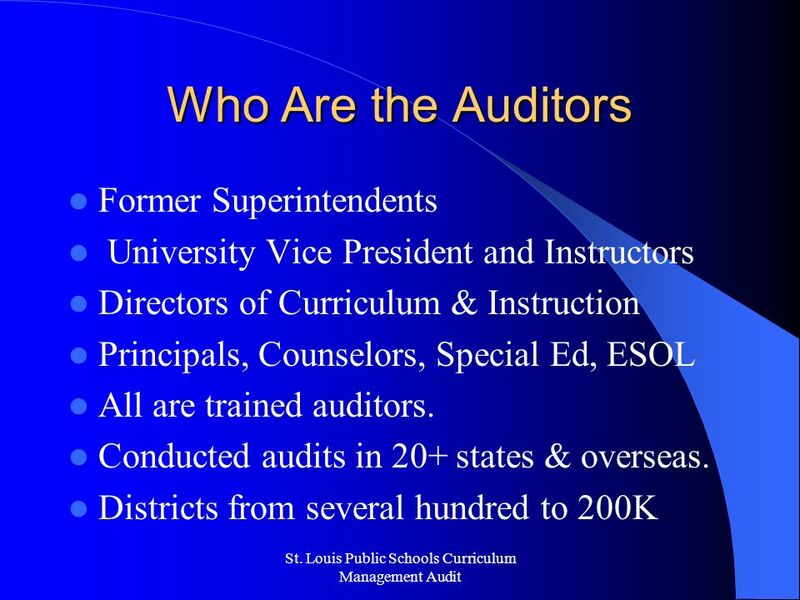 2 St. Louis Public Schools Curriculum Management Audit What is a Curriculum Management Audit? Examination of educational organizations, based on effective schools research. Examines effectiveness of curriculum design and delivery, and instruction. Sources: documents, interviews, site visits. Reveals extent to which the district is meeting its goals & how it might improve. 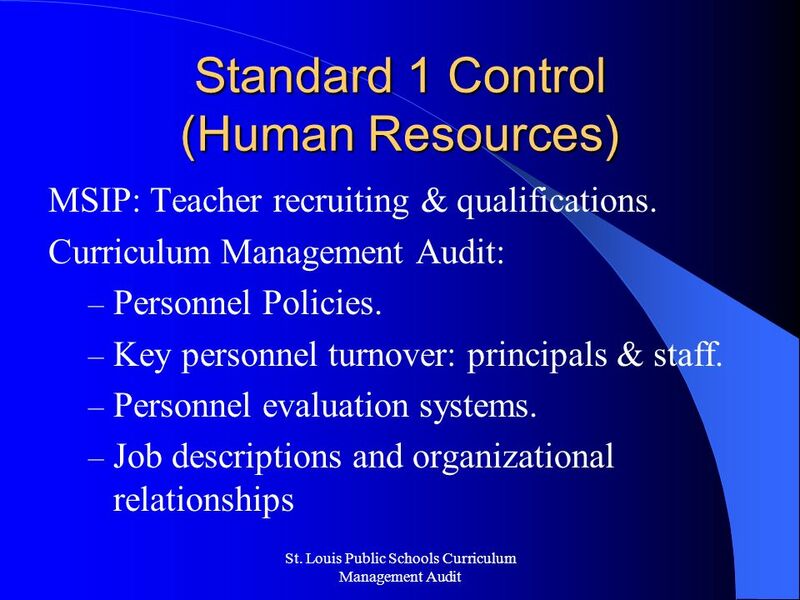 4 St. Louis Public Schools Curriculum Management Audit Audit Standards 1. Control of Resources. 2. Clear, Valid Objectives for Students. 3. Internal Consistency & Rational Equity. 4. Uses Assessment Results to Adjust, Improve, Terminate Practices and Programs. 5. Productivity Improves Over Time. 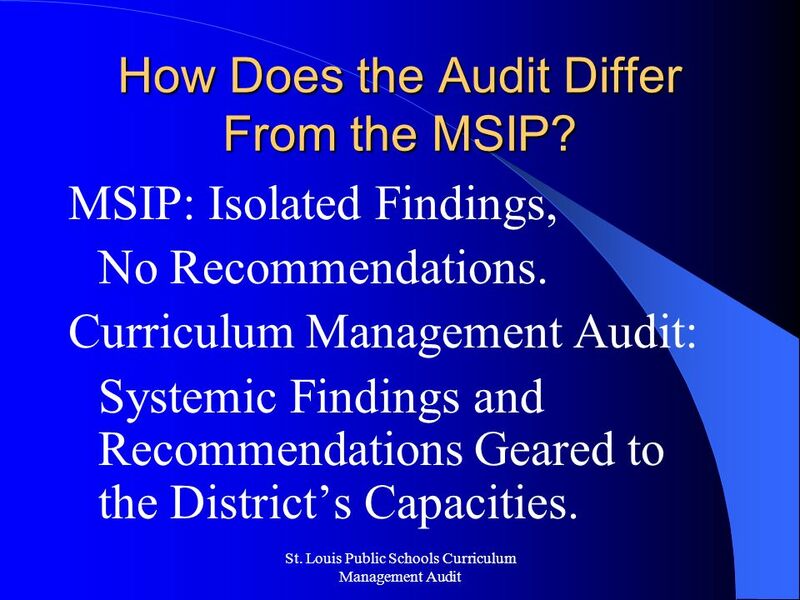 5 St. Louis Public Schools Curriculum Management Audit How Does the Audit Differ From the MSIP? MSIP: Isolated Findings, No Recommendations. 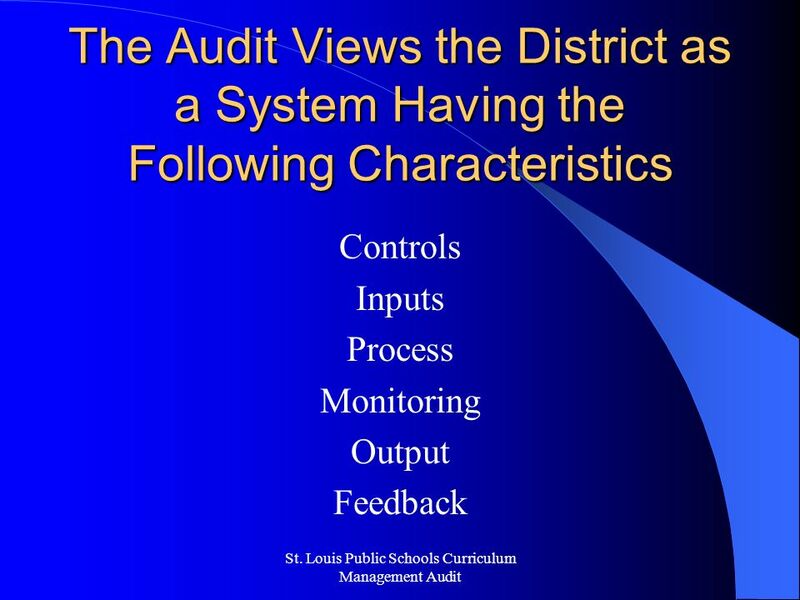 Curriculum Management Audit: Systemic Findings and Recommendations Geared to the Districts Capacities. 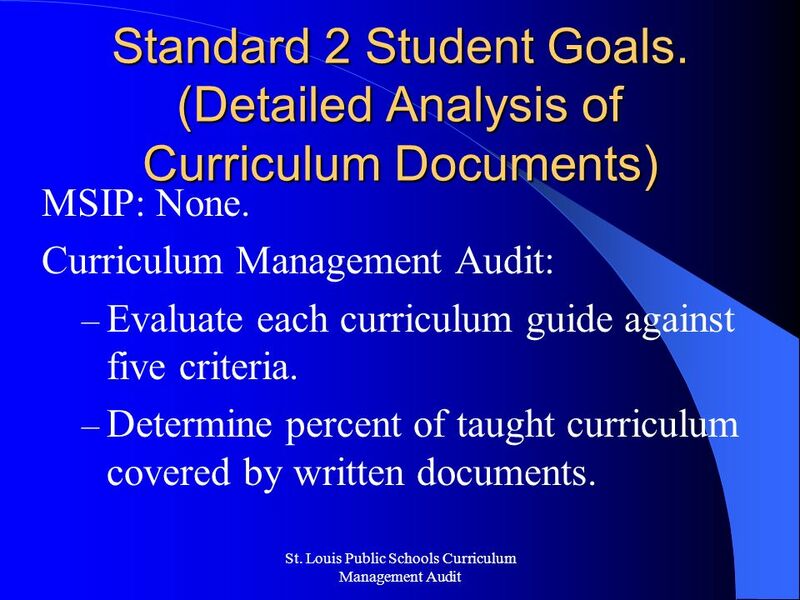 7 St. Louis Public Schools Curriculum Management Audit Standard 2 Student Goals. (Detailed Analysis of Curriculum Documents) MSIP: None. 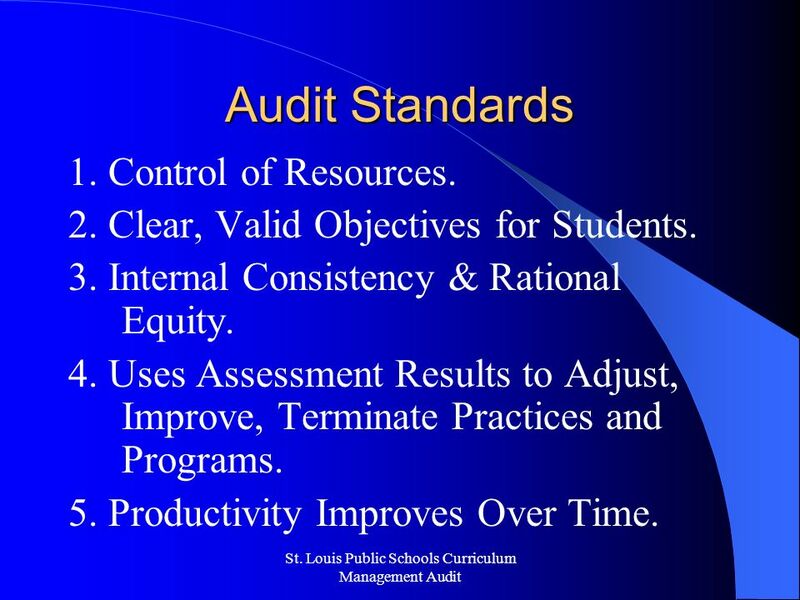 Curriculum Management Audit: – Evaluate each curriculum guide against five criteria. – Determine percent of taught curriculum covered by written documents. 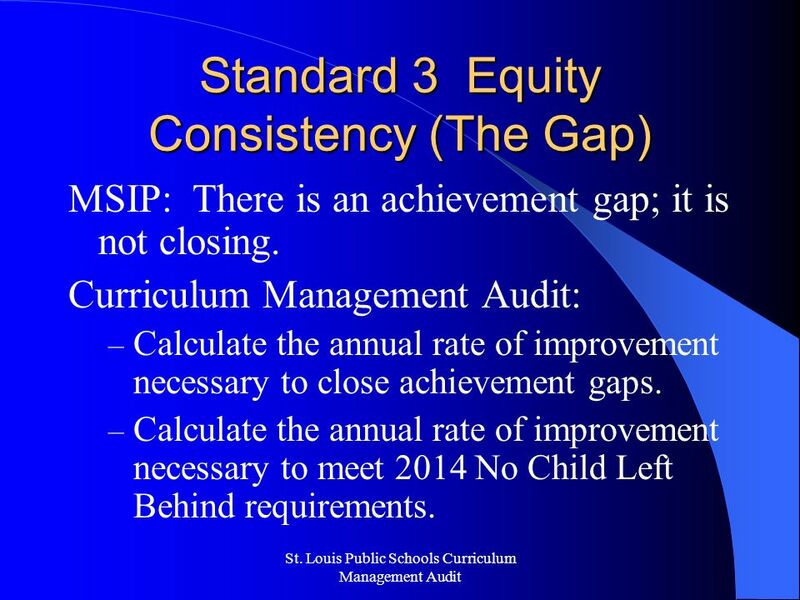 8 St. Louis Public Schools Curriculum Management Audit Standard 3 Equity Consistency (The Gap) MSIP: There is an achievement gap; it is not closing. Curriculum Management Audit: – Calculate the annual rate of improvement necessary to close achievement gaps. – Calculate the annual rate of improvement necessary to meet 2014 No Child Left Behind requirements. 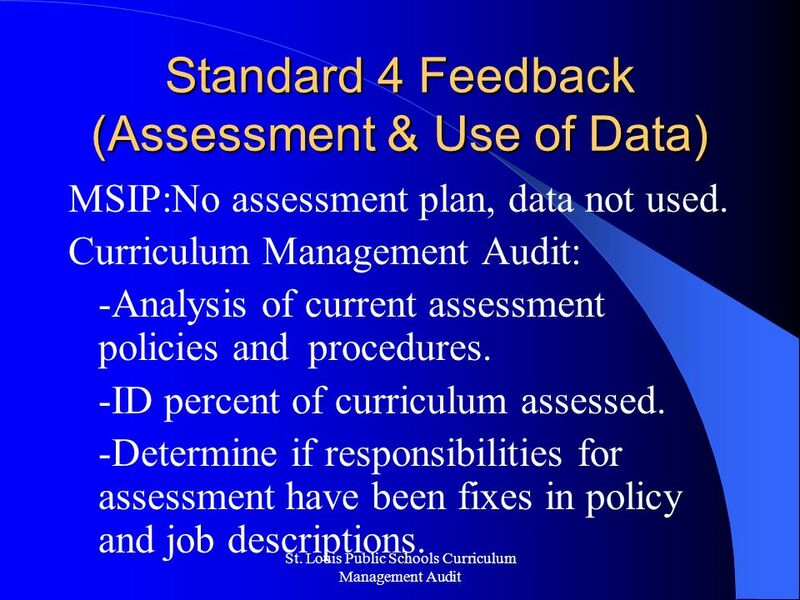 9 St. Louis Public Schools Curriculum Management Audit Standard 4 Feedback (Assessment & Use of Data) MSIP:No assessment plan, data not used. 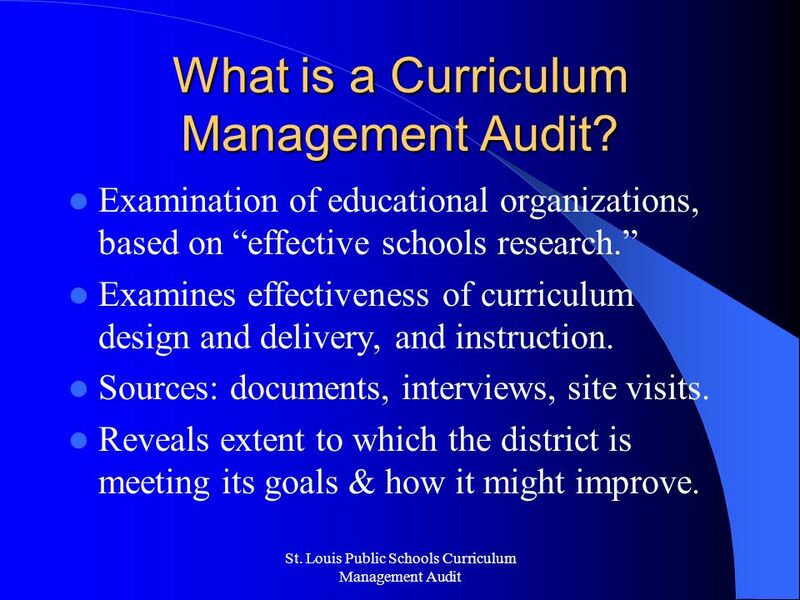 Curriculum Management Audit: -Analysis of current assessment policies and procedures. -ID percent of curriculum assessed. -Determine if responsibilities for assessment have been fixes in policy and job descriptions. 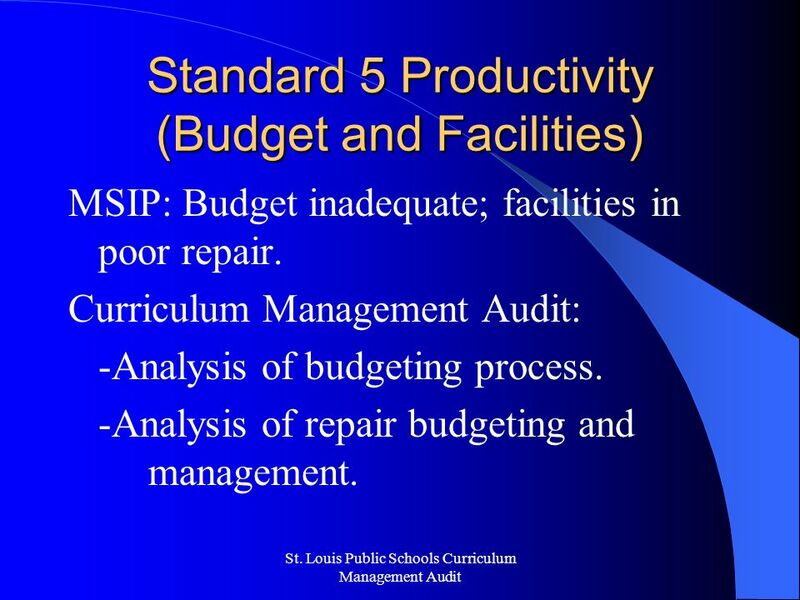 10 St. Louis Public Schools Curriculum Management Audit Standard 5 Productivity (Budget and Facilities) MSIP: Budget inadequate; facilities in poor repair. Curriculum Management Audit: -Analysis of budgeting process. -Analysis of repair budgeting and management. 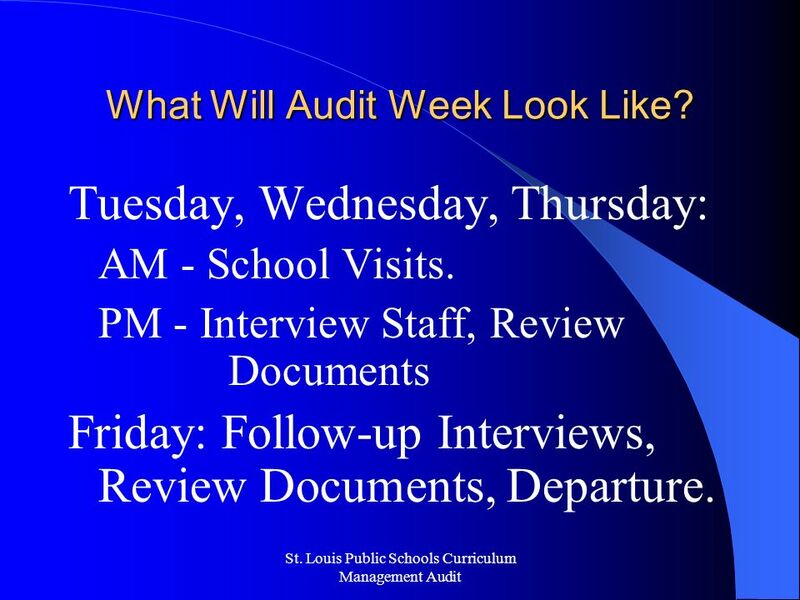 11 St. Louis Public Schools Curriculum Management Audit What Will Audit Week Look Like? Monday: Interview staff, Board members, community representatives. Review documents. 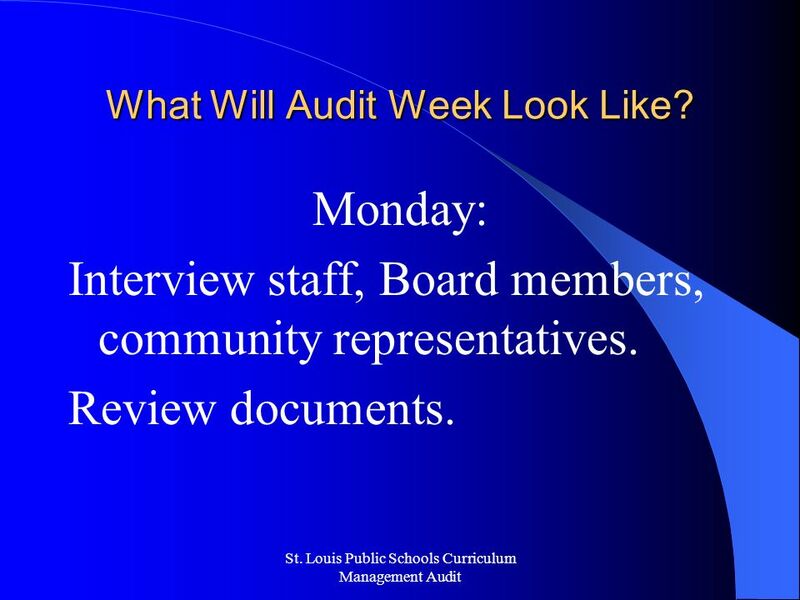 12 St. Louis Public Schools Curriculum Management Audit What Will Audit Week Look Like? Tuesday, Wednesday, Thursday: AM - School Visits. PM - Interview Staff, Review Documents Friday: Follow-up Interviews, Review Documents, Departure. 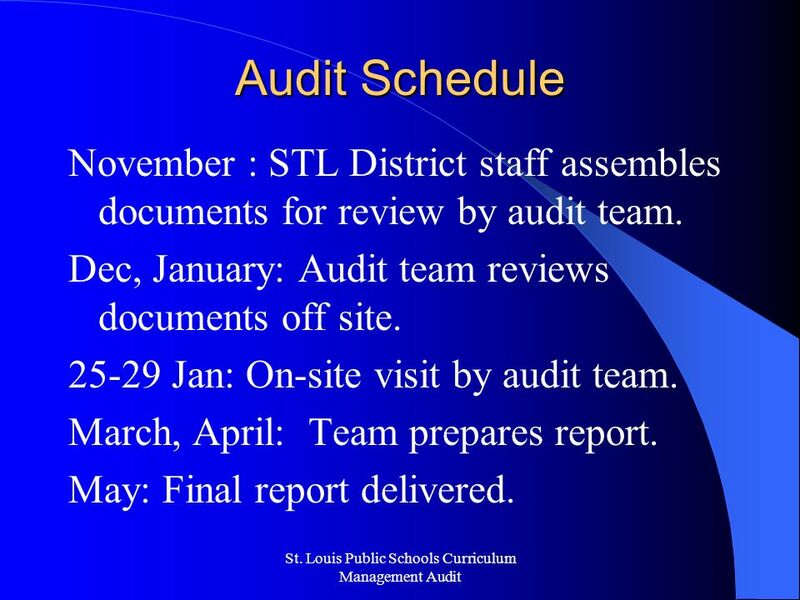 13 St. Louis Public Schools Curriculum Management Audit Audit Schedule November : STL District staff assembles documents for review by audit team. Dec, January: Audit team reviews documents off site. 25-29 Jan: On-site visit by audit team. March, April: Team prepares report. May: Final report delivered. 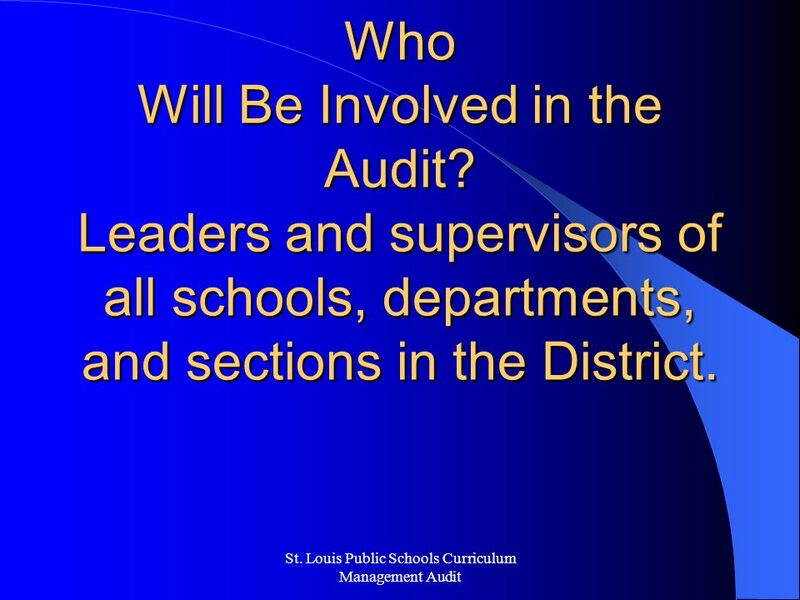 14 St. Louis Public Schools Curriculum Management Audit Who Will Be Involved in the Audit? Leaders and supervisors of all schools, departments, and sections in the District. 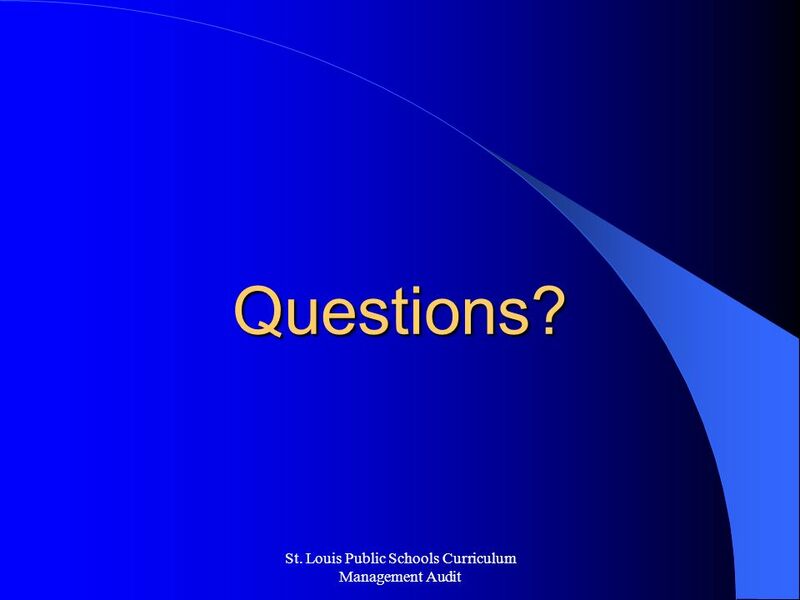 16 St. Louis Public Schools Curriculum Management Audit Questions? 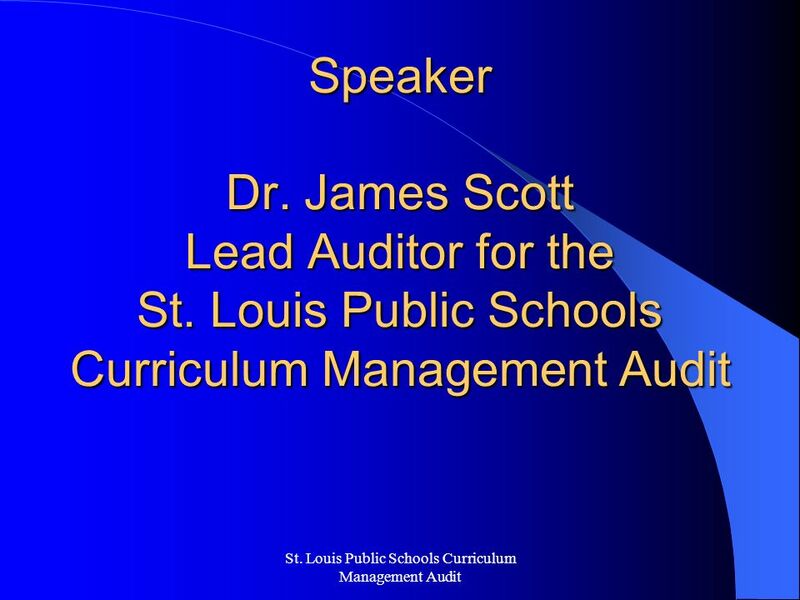 Download ppt "St. Louis Public Schools Curriculum Management Audit Speaker Dr. James Scott Lead Auditor for the St. Louis Public Schools Curriculum Management Audit." Procedures for ESEA Consolidated Monitoring Effective July 1, 2011 – June 30, 2014 Monitoring For Results.  Best Practices in Charter School Authorizing. Presentators  Mike McHugh – Executive Director, Sarasota County Schools (Retired), President – McHugh. A Presentation on the Management and Curriculum Audit for the Guam Public School System April 14, 2009. RENEWAL & SUCCESSION CONSIDERATIONS Elisa A. Falco, Director of Education & Training. School District of Palm Beach County 2012 Finalist. AN EXTRAORDINARY OPPORTUNITY FOR OUSTANDING TEACHERS OF ENGLISH LANGUAGE LEARNERS TO TRANSFORM PUBLIC EDUCATION IN MASSACHUSETTS [i] [i] Teachers who already. 1 2008-2009 School Year Calendar Options Presentation – Board of Education October 10, 2007.